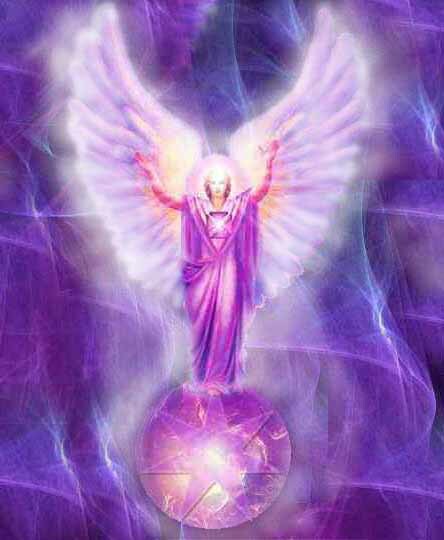 This is Archangel Zadkiel, along with Holy Lady Amethyst, and we come to you from the Violet Ray of Transmutation and Transformation. Beloveds, we welcome you to receive the Light. You have journeyed far and wide to progress on your path of ascension, and now it is time to receive the Light of expanded consciousness. This is a time of rejoicing, for you are shifting into a higher state of awareness. A higher quality of Light is being sent to you and your planet during these times of accelerated ascension. This Light has a higher frequency and potential than what has previously been available. Therefore, many opportunities are there for you to incorporate and work with this higher vibration in order to assist you in your personal ascension. The Rays of Light are being infused with higher-level Christed Light, and this will bring about an upshift in your vibration and chakras when you focus on this Light and transmute and balance any old energy that you wish to release as you go forward. Using the Violet Flame to transmute this old energy can help you prepare your chakras to receive this refined Light. Many infusions of refined Light are being sent. This offers you an opportunity to advance at your own rate. You are being sent many infusions so that the releasing and balancing process is done in a sequence rather than all at once. This makes the process of upshifting much easier for you to assimilate. The infusions of refined Light are vibrating at a higher frequency than what you may have been accustomed to experiencing. When this higher frequency Light contacts a lower frequency energy, it has a tendency to dislodge the lower energetic pattern and bring it to the surface. It is not a matter of judgment. It is simply a pattern of energetic nature. Each time you receive an infusion of refined Light, you have the opportunity to look at what is being presented and decide whether to release what is being brought to your attention. Great progress can be made by extracting the lesson that surrounds the old energy prior to releasing it. You can then use the Violet Flame to transmute and transform each packet of old energy that you are releasing. By using this process of transmutation and transformation, the energy that you are releasing and sending forth has been balanced and returned to a neutral point. Therefore, it will not cause harm to others as it is released. This also prepares you to receive the higher vibrational Light because, in the transmutation process, you have forgiven, transmuted, transformed, balanced, and released core, seed patterns. You are moving forward with a clear energetic pattern, and this allows you to receive the higher vibrational Light. It is a process similar to preparing the soil for planting by removing any weeds or old plant material and turning the soil before planting new seeds. When you prepare the soil of your energetic pattern, you are ready to receive the seeds of a new and expanded consciousness. This is an ongoing process, for there are unlimited levels of consciousness to which you can ascend. Each level unfolds into the next level. It is as if the boundaries of the previous levels dissolve, and a new vista unfolds for you to behold. You have incorporated all the learning and understanding at one level, and you carry this understanding with you as you move to the next level. It is similar to progressing through the grades in school, where you master one level of knowledge and carry it forward as you incorporate new knowledge. It is also similar to looking through a telescope. You can look at where you have been and recognize it, even though you are no longer there. You can also see your progress and know that you have incorporated greater understanding. You know that, if it is your desire, you will continue to progress, for you know that it is the nature of the universe to expand to incorporate greater understanding. In receiving the Light, along with an expanded consciousness will come a greater capacity to love. The higher Rays of Light contain a much greater percentage of adamantine particles of Light, which can only be accessed through love. The more you increase your capacity to love through raising your vibration, the higher the quality of Light you can receive. The releasing of old energetic patterns will allow you to receive this increased quality of Light and to experience a greater connection with All That Is. Tuning in to this vibration of love and letting it expand your heart center will allow you to increase your own capacity to feel love for all beings – human, plant, animal, the earth, your universe, and all universes beyond. The expansion of your capacity to love is one of the greatest gifts you can give yourself and all of humanity, for this is what will allow humanity to ascend. When you feel an expanded capacity to love, your aura radiates out to touch many Souls who are around you. As they feel your radiance, it may spark a recognition within them of their own Divinity. You can serve as a Way-Shower simply by being your loving self around those with whom you interact. Love touches hearts in a way that far exceeds what words can do. You become a living example of Love and Light. Beloveds, you may wish to spend some time each day focusing on the higher Light that is being sent and what it brings to your awareness. In this way, you are consciously choosing your path of advancement to higher consciousness at your own individual pace that feels right for you. By receiving the Light, you are receiving the gifts that are divinely yours. Beloveds, we rejoice in your path of progression and ascension. Know that you are greatly loved in the Light.